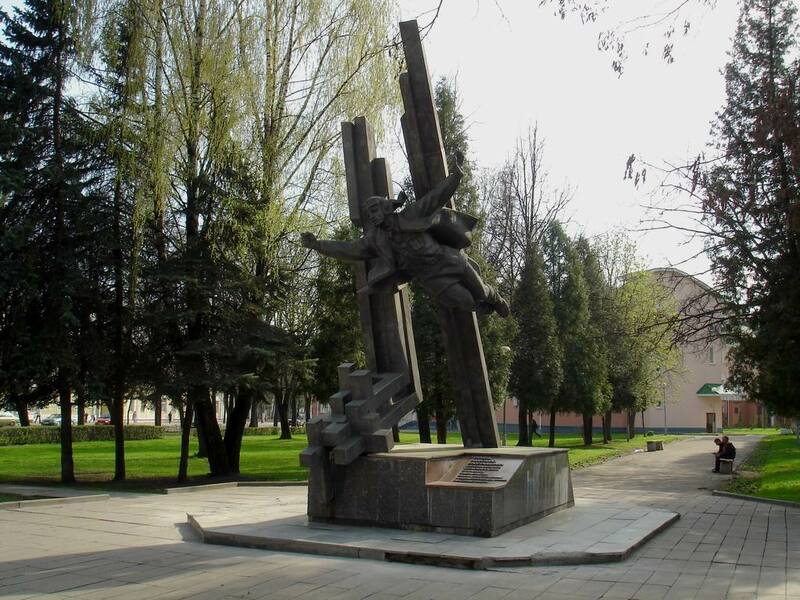 Monument to pilot A.Gorovets was installed in Vitebsk relatively not long ago: in 1995. Those who are keenly interested in the history of Belarus during the Great Patriotic War,should to look at this granite construction by sculptors Inkov and Artimovich, together with architect Rybakov. Beside it you feel close interweaving of past and present centuries. 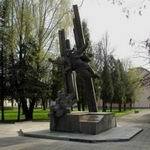 What is interesting about pilot Gorovets, whose sculpture is one of the best monuments in Vitebsk? Alexander Gorovets, Hero of the Soviet Union, was born near Vitebsk, in Moshkany village, Senno district. In Vitebsk he graduated from seven year school, worked as a mechanic and studied at a flying club. In the early 30s he studied in Polotsk Forestry College. In 1935 he graduated from a flight school in Ulyanovsk, and in June 1942 went to the front as deputy commander of a squadron of fighter aviation. Gorovets made 74 assault flights, destroyed 11 enemy aircraft, 40 vehicles, 24 carts. July 6, 1943 he joined the battle with 20 bombers, shot 9 aircraft down, which is a recognized record. So there is another monument to pilot A.Gorovets installed on Moscow-Simferopol highway in 1957 in a place where he heroically died. Only at the end of the last century the authorities of the city of Vitebsk felt that historical Vitebsk of the holy war era deserves a worthy celebration of the hero-pilot. The appearance of this monument is the best contribution to the culture of Vitebsk. 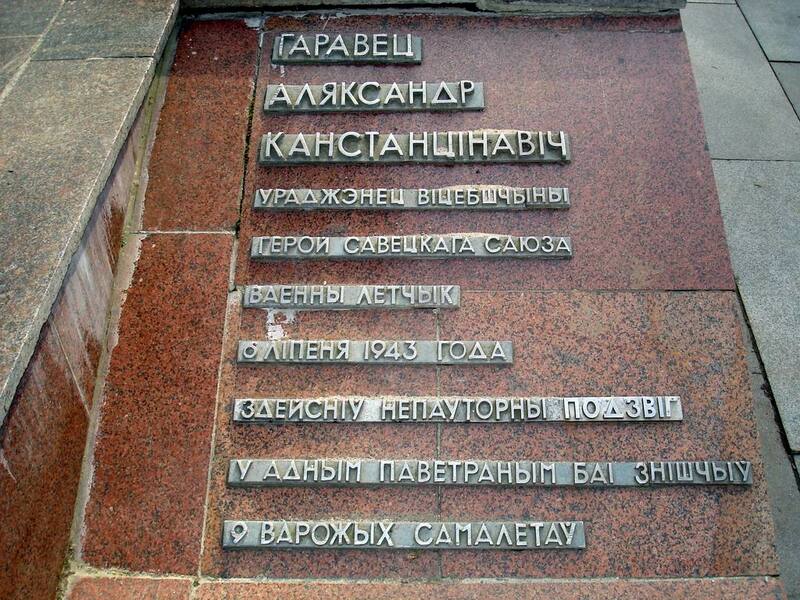 A street in Vitebsk is named after him (1957), where his parents lived, and a flying club (1980). 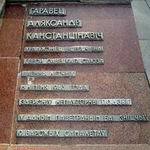 Streets in Minsk and Bogushevsk bear his name. The monument to pilot A.Gorovets is located in a park named after Gorovets between Gorovets street and Kommunisticheskaya street. Portals about Vitebsk, such as VitebskCity.by, will kindly travel with you to interesting places in Vitebsk, located next to the monument in the park named after Gorovets. You can enjoy exotic flowers of the Botanical garden, classical music in the building of Vitebsk Philharmonic Hall, rest the soul in the church of the Assumption of the Blessed Virgin Mary.